FOBISIA's annual Leadership Conference is held each November in Bangkok and an alternative location in Asia every other year. The conference brings together Heads and Senior Leaders of FOBISIA's Member Schools for professional development and networking to promote high-quality British-international-style education. During Term 2 of each academic year, FOBISIA HQ invites Member Schools and Educational Organisations to register their attendance. 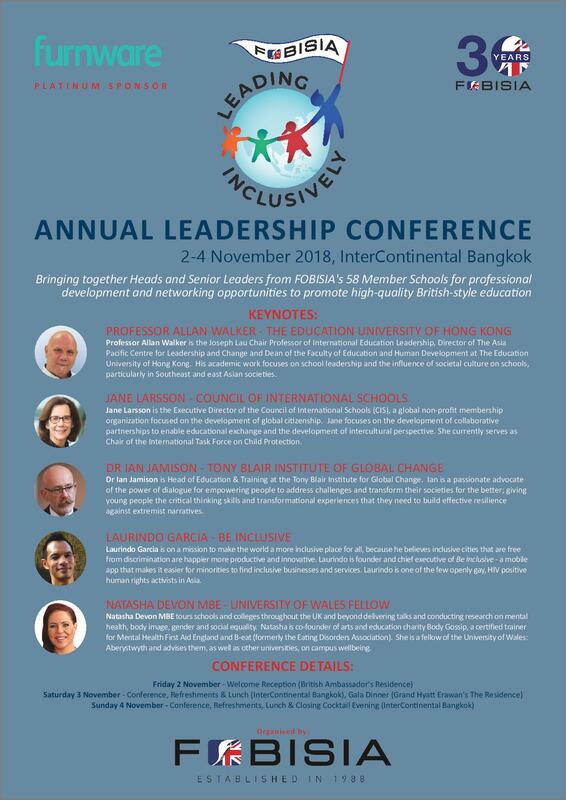 If you have any questions about the annual FOBISIA Leadership Conference, please contact FOBISIA HQ. The 2019 Leadership Conference will be held between 8-10 November 2019 at the Sheraton Grande Macau Hotel, Cotai Central, in Macau. The 2018 Leadership Conference was held between 2-4 November 2018 at the InterContinental Bangkok, in Thailand.